バリバリブギ～涙のフルーツポンチ～'s pop'n music banner, as of pop'n music 15. バリバリブギ～涙のフルーツポンチ～'s pop'n music old banner. バリバリブギ～涙のフルーツポンチ～ was added to GUITARFREAKS 10thMIX & drummania 9thMIX on December 17th, 2003 via ee'MALL 2nd avenue. バリバリブギ～涙のフルーツポンチ～ could be unlocked to pop'n music 10 and 11 from April 14th, 2004 to April 26th, 2004 via ee'MALL 2nd avenue. It was later added to pop'n music 10 and 11 on April 27th, 2004 via ee'MALL 2nd avenue. 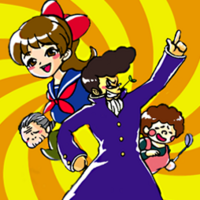 Before pop'n music 15 ADVENTURE, バリバリブギ～涙のフルーツポンチ～'s character was Bronson [9-2P]. バリバリブギ～涙のフルーツポンチ～ marks the first appearance of the vocalist Hedel Bendel in pop'n music. バリバリブギ～涙のフルーツポンチ～ has never been on a CS GuitarFreaks & DrumMania nor CS pop'n music release. On the original GuitarFreaks & DrumMania series, バリバリブギ～涙のフルーツポンチ～ was not available for session play. 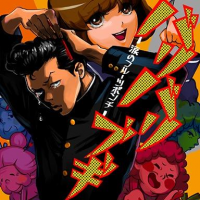 バリバリブギ～涙のフルーツポンチ～ is one of the revivals of the Shuku! Oniisama Birthday (祝!お兄様Birthday) unlocking event of GITADORA Tri-Boost. It could be unlocked by obtaining 8 candles on the event. It received a new jacket in GITADORA Tri-Boost. In GITADORA Tri-Boost Re:EVOLVE, it could be unlocked as part of the Shinshun! GITADORA OMIKUJI (新春! ギタドラOMIKUJI) event from January 11th to 31st, 2017. In GITADORA Matixx and EXCHAIN, it can be unlocked by clearing it in Deluxe Mode.